When your baby has a stuffy nose, your mom's first suggestion might be to set up a hot-steam vaporizer. During the winter months, your doctor might suggest using a cool-mist humidifier to keep nasal secretions lose rather than crusty and to keep a rashy child from developing itchy, dry skin. Both types of air moisteners have their benefits and drawbacks, but steam vaporizers have more risks. You might remember sitting in a room filled with hot steam as a child, whether it was the bathroom or your own room. You might even remember having a towel draped over your head so you'd breathe in even more hot steam from the "croup kettle." Hot steam is quite effective at loosening secretions in the respiratory tract, but it has one major drawback. The steam -- and the water in the machine used to produce the steam -- are hot. 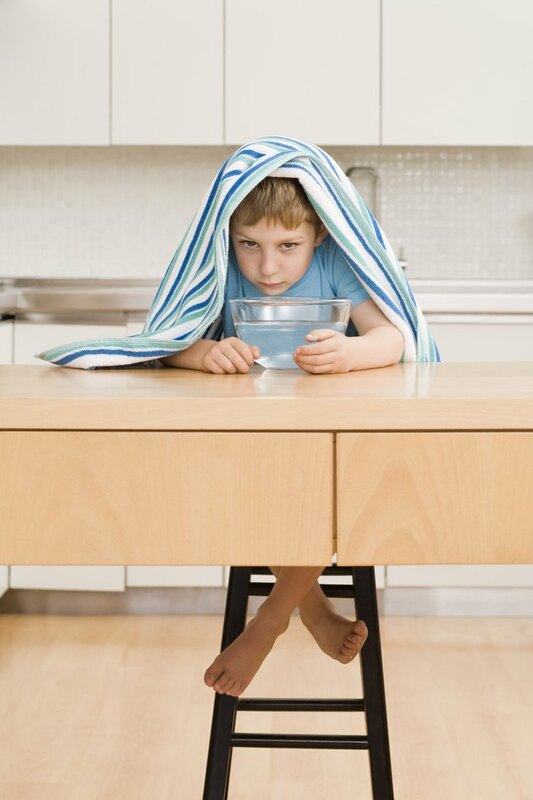 If your child gets too close to the steam or spills the water on himself, he could suffer a bad burn. For this reason, Dr. Jay Hoecker of the Mayo Clinic recommends using a cool-mist humidifier rather than a vaporizer system. Running a hot-steam vaporizer also costs more. Humidifiers keep the air moist using cool air, which helps your child breathe just as easily as steam when he has a respiratory disorder such as a cold, bronchitis or pneumonia. Whole steam might seem more comforting, but by the time the mist reaches the lower part of his lungs, it's the same temperature, regardless of whether it came from a vaporizer or humidifier, according to The Children's Hospital of Philadelphia. Humidifiers also keep the air moist in the winter, when central heating reduces the amount of moisture in the air. Cool-mist humidifiers also have a major drawback; they're a major source of bacterial and mold growth if you don't keep them scrupulously clean. Rather than helping a child's respiratory symptoms, mold or bacterial contamination can cause more serious illness in your child if he suffers from asthma or another chronic lung disorder. To avoid mold and bacterial growth inside a cool-mist humidifier, soak all parts that come in contact with water in a 10 percent bleach solution every two to three days, The Children's Hospital of Philadelphia recommends. Change the water daily as well. Set up a humidifier in an area where your child won't trip over the cord or spill the water. Spilling water near electrical appliances or outlets could cause an electrical shock. Unplug the unit when not in use. Avoid units made in the shape of toys, since children might be more likely to try and play with them. The American Academy of Pediatrics advises using humidifiers only when necessary, to prevent exposure to mold or bacterial contamination. What Can I Put Under a Baby's Nose to Help With the Dry Skin From a Cold?